How to make sure a piece of content is only seen by a certain segment of your audience. How do I limit an article's views to only be seen by a specific segment? Good question! The answer can be found in the Distribution Settings of your Content Manager. To access the Distribution Settings, go to your Content Manager, click on your Content Icon of choice, and then find the yellow gear at the top right hand corner of the screen. This will prompt a sidebar to appear with various settings for you to control. The second option is labeled Segments. Here you can choose what segments you would like that piece of content to be sent to. 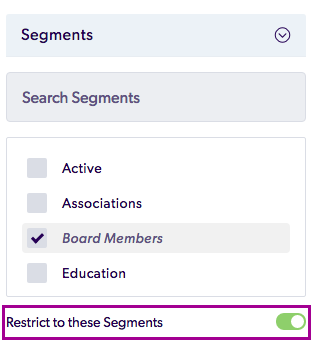 If you would like that piece of content to be restricted to a certain segment or segments, you can simply flip the switch on "Restrict to these Segments". This will ensure that the content is only viewed by the segment of your choice.